BACKGROUND: Whilst the discourse of palliative care in HIV management is largely documented and regarded as being an essential component, various authors have further argued that within the context of HIV care in sub-Saharan Africa, palliative care and exploration of the dimensions thereof is largely lacking. This article presents the lived experiences of nurses involved in palliative care, thus providing the perspective of nurses and the multi-faceted dimensions of the nature of caring inherent. OBJECTIVES: This study explored the respondents' understanding of the concepts 'caring' and 'terminal patient' and described the experiences of nurses caring for terminally-ill patients with HIV and how these experiences influence the nature of care rendered. METHODS: Qualitative research using Husserl's approach of phenomenology design underpinned the study and Giorgi's steps of analysis were used to make meaning of the data. RESULTS: The concept 'caring' was experienced by the nurses as transforming the patients' quality of life through supportive care and hope for life. Palliative care made the nurses conscious of their own mortality, enabling them to be more sensitive, compassionate and dedicated to caring for their patients. The findings described the social networking that enabled nurses to collaborate with colleagues in the interdisciplinary teams and shared knowledge, skills and support within the palliative care team in order to optimise patient outcomes. CONCLUSION: Nurses with prolonged involvement in caring for terminally-ill patients with HIV experienced helplessness and emotional stress. Recommendations based on the results are that training in psychological and holistic care of the patient, professional counselling and stress management services are needed to support the nurse in this context. Hospital-based HIV palliative care has been the subject of very few research studies (Tapsfield & Jane Bates 2011). Further to this, the Ethics Committee of the University of KwaZulu Natal, after their review of literature related to this area, approved the study which is the basis of this article. Whilst the discourse of HIV management and palliative care is widely documented (Cullinan 2006; Demmer 2006; Mabude et al. 2008), empirical evidence has also illuminated the need for further research into unpacking the intricate nature of palliative management from the caregiver's perspective (Orner 2006; Singh et al. 2011). The HIV pandemic has been attributed to causing nurses to feel overwhelmed by the high number of terminally-ill patients they care for who, because of the nature of their compromised illness, require more specialised care than other patients, thus exacerbating the burden on the nurse (Cullinan 2006; Demmer 2006). The nurses' situation is compounded by their contextual issues which include unmanageable workloads, managerial inadequacies and the existing 'paradigm of inequity' between the public and private health sectors (National Labour and Economic Development Institute 2006). South African public hospitals are heavily challenged (South African National AIDS Council 2011). Over 80% of the country's population have no medical aid cover and are forced to seek treatment in government clinics and hospitals (South Africa 2009). The National Department of Health's 10-point plan strategy (Department of Health 2010) estimated the costs of uninsured people in the public sector at R85 billion as opposed to R113 billion's worth of insured South Africans in the private sector. Of all the HIV-related deaths in South Africa, KwaZulu-Natal is ranked as having the highest rate, at 14.2%, followed by the Northern Cape (8.3%) and the Eastern Cape at 5.3% (Statistics South Africa 2010). In 2008, a slight decline in HIV-related deaths occurred, particularly in the age group of 15-24 years. This drop accounts for 3.3% of deaths. HIV is ranked fourth amongst the 10 leading causes of natural deaths in the same age group (Statistics South Africa 2013). The in-house statistics of the hospital in which the study was conducted showed that in 2010, between January and March, there was a progressive increase in the number of people dying of HIV-related illness - an average of 7.1% of the deaths per month. In 2011, the monthly mortality rate of people dying of HIV-related illness increased progressively from 4% in October, to 11% and, finally, 13% in December (Department of Health 2012). The escalating number of deaths was one of the factors that motivated the researcher to explore the lived experiences of nurses whilst nursing patients with terminal HIV-related illness, in order to understand the phenomenon from the nurses' perspective. Furthermore, the literature review showed very few studies conducted in the palliative care of people suffering from HIV-related illness or disease in sub-Saharan Africa; most studies were Euro-centric within oncology settings. Research findings, such as those of De Villiers and Ndou (2008), have shown that negative emotions lead to unethical behaviour on the part of the nurses and their inability to create the therapeutic relationships of caring, mutual respect and trust necessary for the protection of the legal and ethical rights of HIV patients. The public has high expectations of nurses, expecting them to provide quality care for patients at all times, regardless of their illness (US Agency for International Development 2009). This study was designed to explore and describe the experiences of nurses caring for patients with terminal HIV-related illness and how these experiences impact on the lives of operational nurses on a daily basis in the context of nursing in palliative settings. Palliative care is a fundamental aspect of HIV management, despite the increasing availability of antiretroviral treatment as part of the package of care for patients with terminal HIV-related illness. In South Africa, this challenge is exacerbated by the increasing numbers of very ill and dying HIV patients who tend to suffer from complications of the disease and need more specialised care than most other patients (Mngadi 2006). The findings of the study may assist nurse managers and nurse educators with regard to the development and incorporation of educational programmes in their policies and curricula that teach effective coping strategies aimed at minimising 'death anxiety' amongst nurses. The findings may also contribute to evidence-based clinical practice on service delivery approaches such as strategic planning for individualised user-friendly palliative care needs in order to improve patients' quality of life and to identify potential areas for further research regarding caring for patients with terminal HIV-related illness or disease. The study may also improve access to palliative care services in all settings of care delivery and enhance support for HIV programmes, particularly in South Africa where little research in palliative care settings has been conducted. 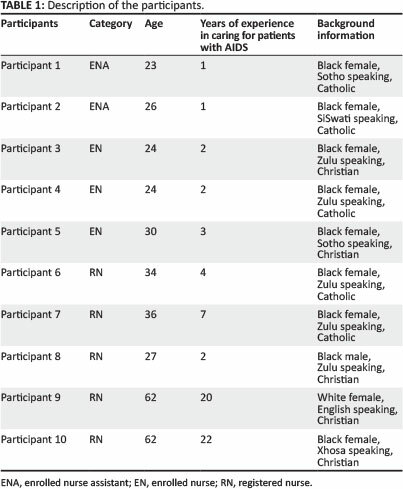 The aim of the study was to explore and describe the lived experiences of nurses caring for patients with terminal HIV-related illness in selected wards of a level one district hospital in KwaZulu-Natal. To explore the nurses' understanding of the concepts of 'caring' and 'terminal patient'. To explore the lived experiences of nurses caring for patients living with terminal HIV-related illness. To explore how the nurses' experiences influence the care they provide to terminal patients with HIV-related illness. What is the nurses' understanding of the terms 'caring' and 'terminal patients'? What are the nurses' perceptions of their experiences in caring for patients living with terminal HIV-related illness. How do the nurses' experiences influence the care they give to terminal patients with HIV-related illness? Caring is an abstract concept that affirms life rather than death and refers to managing the pain and symptoms of patients who have terminal HIV-related illness or disease in order to maintain their quality of life in their continuum of care whilst in palliative wards. Lived experience relates to what the nurses do, see and feel; and the unique problems they encounter whilst caring for patients with terminal HIV-related illness. Level 1 district hospital is a hospital registered to deliver prescribed district services from recognised primary healthcare clinics for further management in order to improve the local healthcare needs of patients, but which transfers patients with complications to level 2 hospitals. Clinical nurses are registered nurses, enrolled nurses and enrolled nursing assistants who care for patients with HIV-related illness or disease in palliative care wards. Their performance is based on knowledge and application of biological, physical and social sciences on completion of a course of training at an approved school of professional nursing. Palliative care is the provision of total care by the operational nurses, involving the psychosocial, physical and spiritual well-being of adult patients suffering from HIV-related illness and including support of his or her family, from the time of diagnosis until the death and bereavement stages. Terminal patient or terminal illness refers to patients with HIV-related disease, at an advanced or progressive stage. Although the general prognosis is poor as there is currently no cure for the disease and because inadequate treatment may lead to death, some patients recover 'miraculously' and live for a long time thereafter. Qualitative methodology, using the Husserlian phenomenology (Laverty 2003), was used with an observational (specifically, the field notes), exploratory and descriptive design to collect in-depth information on the lived experiences of the nurses. The nature of this approach allowed the researcher to be absorbed actively in the subject of the study and to gain an in-depth understanding through the detailed descriptions and explanations provided by the nurses. The field work was conducted during August 2010 and September 2010. The information document on the study was explained to the participating nurses and consent was signed. Individual appointments were arranged with each participant for the interviews at times and in locations chosen by them. The interview schedule consisted of the three research questions in English and some probes to facilitate discussions with the nurses. The information obtained from the participants was recorded using the tape and also transcribed manually by the researcher who subsequently checked the information with the participants to promote objectivity. Interviews took 45 to 60 minutes. Field notes were taken during each interview. Data analysis was based on Giorgi's five steps (Giorgi 1985) which involved: (1) getting the general sense of the whole statement; (2) re-reading the text for the purpose of delineating meaning units focusing on the phenomenon being studied; (3) relating the meaning of the units to each other to gain a sense of the whole; (4) transforming everyday expressions into psychological language; and, finally, (5) synthesising the transformed meaning units into a consistent statement of structure. This study was conducted in a level 1 district semi-private, 200-bed hospital (approximately 60% state-subsidised and 40% donor-funded), situated in the eThekwini District on the outskirts of Durban, KwaZulu-Natal and serving over a million people. The hospital provides level one generalist services to in-patients, with medical, surgical, obstetric and theatre services (for minor operations and caesarean sections), outpatient care for adults and paediatric care. The study population included all nurses working in the palliative care wards of the hospital: professional nurses, enrolled nurses and enrolled nursing assistants. In general, around 30 nurses work in these wards. Permanent employees work on a permanent basis in palliative wards whereas fixed-term employees are rotated as operational needs arise. The palliative care wards comprise 44 beds, of which two wards of 18 beds are for men and three wards of 26 beds for women. Apart from a few other medical conditions, such as hypertension or diabetes mellitus, the majority of patients diagnosed with HIV, both those who are classified as being at stage 3 AIDS (and are thus critically ill on antiretrovirals) as well as those who are not yet on treatment, are admitted to these wards. A purposive sample of 10 operational nurses was selected to participate in this study. An inclusion criterion of nurses with a minimum of one year caring for AIDs patients and who were willing to participate was used in order to ensure that all the participants had experienced the matters under study and were willing to share their lived experiences. The demographic characteristics of the sampled participants varied: the mean age of the participants was 34.8 years (range 23-62 years) and the mean number of years' experience in caring for patients with AIDS was 6.4 years (range 1-22 years). Table 1 provides a description of the participants. The study identified the lived experiences of the nurses in two categories, along with their associated themes and subthemes. The two categories based on the research questions were: (1) conceptualisation of the core terms of caring and terminal illness; and (2) care experiences in the context of HIV-related illness. The participant nurses described caring as arising from one's background and transforming the lives of people with HIV and AIDS. These characteristics are examined in the following sections. The study revealed that terminal Illness was conceptualised by the participants as having the aspects of requiring long-term care and raising consciousness regarding HIV. The cognitive and practical meanings of these aspects reflect how nurses perceive their role in preserving the quality of life of patients with terminal HIV-related illness. From the data analysis, three themes emerged as being compelling forces that influenced the nurses' actions, behaviours and opinions as participants described their experiences of taking care of their patients. The themes were conceptualised as: the social networking system; factors hindering provision of quality care for terminally-ill patients; and mechanisms for adjusting to terminal care. Being aware that the nature of caring for terminally-ill patients requires the interventions of a variety of health practitioners, the nurses explained that their inter-dependent roles resulted in a state of affinity with other members of staff. This, in turn, developed into collegial relationships and wider social networks. In the context of providing palliative care and managing their care-giving roles efficiently, participants admitted that, apart from their intrinsic values of love and prayer, they drew upon the support of their colleagues and thus developed friendship networks. It emerged that there were multiple barriers that impeded or hindered the nurses' abilities to provide quality palliative care for the terminally-ill patients with AIDS. Subthemes emerged including: the overwhelming effects of AIDS; and HIV being described as 'just another condition'. Many nurses resorted to accepting HIV-related deaths as a reality of life and palliative care training as a way of coping within palliative wards. Written ethical approval was obtained from the University of KwaZulu-Natal Ethical Committee, on 14 May 2010 (reference HSS/0234/2010H). Permission from the hospital management was obtained so as to ensure that the rights of the participants were protected. This study did not have any direct risk for the participants, as participation was voluntary and was based on experiences regarding palliative care. There was no reported or observed psychological distress noted amongst the participants. Should this have occurred, the researcher had arranged a psychologist from the institution for immediate counselling and support. The information document was given to all selected participants and the researcher carefully explained the nature of the research. Information regarding their right to refuse to participate or to withdraw from the study without repercussion was reinforced in the document. A day after the information sheet was given out, informed consent was sought from willing participants. Before and during data analysis, the transcripts were kept in a locked cupboard to which only the researcher had access. Data were captured on a computer secured with a password known only to the researcher. Audio tapes were kept in locked cupboards which could only be accessed by the researcher. After a period of five years, the data will be deleted permanently and the hard copies kept by the supervisor; and the audio tapes will be destroyed by burning. Trustworthiness of the study was achieved through methods suggested by Lincoln and Guba (1985), by using the principles of sound credibility. This ensures that the findings of the study can be accepted as true. Credibility: On completion of each interview, the researcher gave the participants a short summary to check that their ideas had been captured properly and to provide an opportunity for correction or clarity where necessary. In addition, credibility was ensured through audio-recorded interviews in order to ensure that the researcher did not misinterpret the participants' own wording. Field notes were written immediately following each interview to ensure that no meaningful information was overlooked. Confirmability of the study was established through several techniques. The researcher kept in writing her ideas and experiences (bracketing) as an awareness of personal opinions and beliefs on the care of patients dying from HIV-related illness so that they did not influence the study. An audit trail was established by clarifying the steps taken in the research process in order to ensure that the study adhered to the philosophical underpinnings. Transferability indicates that the material of the study is described in detail so as to enable readers to evaluate the contexts where the conclusions of the research could be relevant. In addition, transferability was achieved through rich description, whereby the research process, the characteristics of the participants and the study context are supplied for readers to determine the extent to which the circumstances are similar to their own context. The nature of work the nurses engage with on a daily basis is prescribed morally by their profession (Zuzelo 2007). They are expected to comply with the wishes of the patients and their families, even though these values may not necessarily be in agreement with their own views. Indoctrination or some moral education (whether taught or modelled) is necessary for the personal development of the nurses so that, as members of the professional body of nursing, appropriate behaviour is consistently evident in meeting the unique needs of patients in palliative care (Tan 2004). The study revealed that the nurses' socialisation background had inculcated values and norms that were applicable to the needs of the terminal patients and, in this way, they did 'fit into their moral profession as carers' (Zuzelo 2007), contributing to the total well-being of their patients by meeting the expected cultural and emotional values of showing respect to their elders and caring for people with HIV and AIDS as if they were relatives. Supportive leadership and personal recognition recommend supportive strategies which advocate for individualised consideration by encouraging behaviours that facilitate other people's needs and preferences such as showing concern for their welfare, thus creating friendly, supportive and therapeutic environments (Rafferty & Griffin 2004). The participants used supportive measures to re-establish a sense of hope and dignity in the patients who were in despair and refusing to take treatment after having been diagnosed with HIV. Patients' lives were transformed by the care shown by the nurses who were in turn emotionally reinforced in their caring roles. With the emergence of effective antiretroviral therapy and palliative medicine, there has been much improvement in HIV management. The control of viral replication has led to a reduction in the premature death of patients with AIDS (South African National AIDS Council 2011). Furthermore, it is a proven fact that HIV-positive patients who have access to treatment and who maintain a 90% adherence rate, have improved their quality and duration of life as compared with one or two decades ago (Masur 2009). Many of the patients who complied with treatment recovered, showing that the effects of the disease had been transformed from terminal to chronic. A study conducted by van Rooyen, Williams and Ricks (2009) on lived experiences of caregivers working with patients dying from HIV-related illness revealed a myriad emotions being experienced by the participants. Most perceived the death of dying patients more positively, as an experience that facilitated mental and spiritual growth. A few found it difficult to accept the death of dying patients and perceived bonding with them as being a threat to their psychosocial well-being, resulting in feeling drained and experiencing burnout. The study participants generally concurred with the former view, taking part in their patients' deaths and listening empathetically to them so as to care as they would want to be cared for. Munro and Edward (2008:123) arguing for the needs of the patients, adding that 'the nurses need to have an understanding of intimate interpersonal relationships in nursing' so that they can maintain therapeutic relationships by taking into account the individual needs of not only the patients, but also their loved ones. Within the palliative care teams and the interdisciplinary teams, the participants created mutual supportive relationships and used humour, love and prayer to contribute positively to the challenges of caring for HIV patients in order to achieve quality patient outcomes in a friendly palliative care context. However, the nurses need management support so that their informal debriefing sessions are formulated into a policy to enable them to sustain the formalised policy consistently without fear of being seen as not doing their actual duties. It is generally known that South Africa is a leading country in sub-Saharan Africa in the provision of palliative care (Kell & Walley 2009). However, it became evident that the demands of caring overwhelmed the nurses and hindered the delivery of quality palliative care to HIV patients. Despite the physical and psychological effects experienced by the nurses in caring for terminal patients, they remained determined, desiring to do more 'to go the extra mile' for their patients in order to achieve quality palliative care delivery. According to Masur (2009), it is generally known that most patients admitted to patient-care units have HIV or need HIV-related treatment, thus clinicians need to consider HIV infection as being one of the major factors in both their short- and long-term assessments of patients. This empirical evidence supports the participants' perceptions in the current study that tuberculosis and pneumonia were almost synonymous with HIV and AIDS and assists in the understanding of their personal challenges in rendering quality nursing care to patients with HIV. In this study, the nurses were 'AIDS fatigued', as they perceived patients suffering from the disease as being an impediment to their academic development and stimulation. In other words, AIDS was no longer an interesting agenda for their learning. Although antiretroviral treatment has shown a successful transition of AIDS from a terminal to a chronic disease state, Mngadi (2006) argues that cost issues hinder the progress of successful outcomes in palliative care, as antiretroviral treatment is neither free nor available to 90% of people living with HIV and AIDS in sub-Saharan Africa. The result is that millions of people are living with the disease and are subject to increasing impairment of the immune system which is exacerbated by opportunistic infections and frequently results in premature death. Consequently, the nurses in the current study were confronted with a situation that was beyond their control, reviving the lives of immunosuppressed patients admitted to palliative care wards. Death occurred on a daily basis and was thus experienced as a reality of life to which they had to adjust and which had to be faced head on in order to allow them to continue caring for patients with AIDS. To improve access to antiretroviral treatment, skills development process is necessary and should include the development of standardised clinical guidelines, simplified recording and reporting systems that assist doctors and nurses in their clinical interventions (Pillay 2010). It is evident that training tailored for palliative care services enhanced the professional and clinical expertise of the nurses. They were in a better position to understand patients' changing conditions and to render appropriate treatment. In addition, the nurses with prolonged experience in palliative care wards coped better than those who had little exposure as they still had to adapt to patient dynamics in terms of diagnosis and the treatment needs thereof. The study was qualitative research amongst nurses working in a district level 1 hospital palliative ward for patients who had terminal HIV-related illness and does not claim to be a quantitative representation of all nurses in KZN district healthcare. The following recommendations from the study findings could help to improve the working conditions of nurses in palliative care wards whilst providing care for terminally-ill HIV patients. It is recommended that institutions review their palliative care work load and attend to staff shortages. The nurses in this study were overwhelmed with the intensive and specialised nature of nursing care which included demanding tasks such as performing a total blanket bath, feeding and giving of medication to very frail patients. The nurses reported a yearning for a break from the routine tasks such as those noted, as well as a chance to engage in more psychosocial interactions with the patients such as listening to the patients' problems, which they did not always have time for during the course of the comprehensive routine care regime. This interaction would assist them in providing holistic and humane care to their palliative care patients. Nurses felt that caring for HIV patients prevented their academic and professional growth and development. Amongst the chronic patients they cared for were those who had opportunistic infections such as HIV-related tuberculosis and pneumonia, thus the nurses had limited exposure to new learning. In addition, the demographic data showed that the age groups of the nurses working in palliative care wards were as follows: five were in their 20s, three in their 30s and two were over 60 years of age; and their experience varied from between three years for eight of them and 20-plus years for the other two. Only two of the nurses had formal training in palliative care. The nurses with prolonged exposure to palliative care wards showed more support and care for dying patients than with those with fewer years of experience; therefore, additional training and experience in psychological and spiritual counselling are crucial when allocating nurses to palliative care wards to assist both patients and their colleagues with regard to palliative care. Social networks between the multidisciplinary teams of doctors and nurses added mutual support humour and enhanced the coping mechanisms of nurses caring for dying HIV patients. In order to achieve effective leadership at all levels, from the basic categories of nurses to the policy-formulating professionals, it is vital to provide debriefing sessions whereby the palliative teams share their experiences whilst learning from one another so as to improve the quality of life for their patients. Caring for patients with AIDS conscientised the nurses to the reality of their own mortality, as some of them were themselves infected with HIV. To benefit the nursing profession, studies need to focus on nurses who are infected with HIV in order to find out what their needs are and how their positive status impacts on their care of patients with HIV and AIDS. During data analysis, the findings of the study emerged as two distinct categories, namely, (1) conceptualisation of the core concepts of caring and terminal illness; and (2) experiences of caring in the context of palliative care. The conceptualisation of the core concepts influenced the nurses' actions, behaviours and attitudes as they described their experiences with regard to taking care of terminally-ill patients with AIDS. The lived experiences had three main themes: (1) social networking, allowing them to collaborate with colleagues in the interdisciplinary teams and to share knowledge, skills and support within the palliative care team in order to optimise patient outcomes; (2) factors that hinder nurses' abilities to provide quality care for their patients; and (3) the internal and external mechanisms that enable nurses, despite challenges, to provide palliative care. The expressed need for additional training in psychospiritual counselling, as well as an environment that allows for social networking and debriefing sessions amongst colleagues and adequate staffing, will contribute to quality palliative care service delivery for terminally-ill patients. The authors would like to convey gratitude and acknowledgement to the nurses who participated in the study and grateful thanks to the research supervisor, friends, colleagues and management of the hospital for the support and encouragement they provided during the course of the study. N.E.B. (University of KwaZulu-Natal) was the student and primary researcher of this study, who collected and analysed the data for this study. J.R.N. (University of KwaZulu-Natal) was the supervisor of the study and assisted in data analysis of emergent themes.